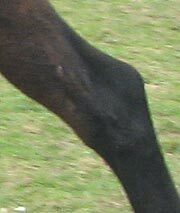 The horse's hock, or tibio-tarsal joint has like other equine limb joints a capsule containing the joint fluid. If the pressure within this joint increases due to inflammation the joint capsule will bulge out of the surface of the hock giving rise to what is called a "Bog Spavin". Manipulation will confirm that these swellings are part of the joint itself - firm pressure on the swelling will result in the fluid being pushed back into the joint and then out again at a different point - usually on the outside rear part of the hock. Bog Spavins tend to be only a cosmetic problem and do not always cause a horse to go lame. They tend to appear in horse with weak hock conformation and may come and go with exercise. If the horse's hock conformation is basically good a veterinary surgeon may drain the fluid from the swellings through a needle under local anaethetic. This will acheive an immediate short term cure for a bog spavin - but the fluid usually returns. Repeated drainage is generally inadvisable. Special elasticated bandages with strategically placed pads are available to place pressure on and thus reduce swelling, but even with these a bog spavin will often reappear.